Your site’s database is basically a giant library. When your site is new, everything is neatly organized, easy to find, and fast to retrieve. But as time goes on, you discover that the librarian is a big-time hoarder. Junk books that nobody will use are still on the shelves, the most popular books are strewn randomly across the back of the library, and the index hasn’t been up to date in years. Since every WordPress page load involves retrieving specific information from your database, it’s crucial that the database is in order. Once we clean house and fire the librarian, your site will suddenly take a notable turn for the better. When your typical cell phone camera has enough horsepower to plaster half a wall with a high res photo, it’s no shock that your typical website home page is bigger than an average MP3 file. And considering that there is next to no visible difference between a 1mb image and a 100kb image on your home page, there’s just no reason to use images of that size. 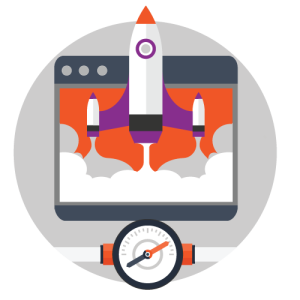 By simply matching your website with the image size it needs, we can often cut your site’s home page size in half which will have a major impact on speed – particularly for those mobile visitors. With more responsibility comes more overhead. Whether that responsibility comes in the form of more functionality (like e-commerce) or more traffic, if WordPress has more to manage, it’s critical that even the finer details of the site are appropriately cached for the site to run like a well oiled machine. With advanced caching, we dive deeper into the internals of your site with database query, object, and even more advanced page and browser caching to make sure that every part of the site is fine tuned to maximize your existing hosting resources. Your typical website’s front end code is a lot like your average meeting – filled with people that don’t need to be there and large pockets of useless banter. A good meeting focuses on an objective, and cuts-out the useless crap. Your website works the same way. By eliminating unnecessary requests from your site’s page load and reducing the size of the typical code file that loads on your site, your visitors are able to spend less time waiting for the site to load and more time interfacing with your business. WooCommerce is one of the most popular e-commerce systems in the world thanks to its ease of use and integration with WordPress. But as with all e-commerce software, as your site grows in sales, products, and traffic, more and more horsepower is needed to keep up with an increasing pile of information that it has to manage just to keep the sales rolling in. And it’s often no more noticeable just how direct an impact speed has on your business than with e-commerce as sales drop noticeably with each second. But by reorganizing the database to more effectively manage the data on hand, you can get back to the sane site speeds you expect from your website. If you’re trying to squeeze every last ounce of speed out of your WordPress install without having to change your hosting infrastructure or recode your site’s themes and plugins, an Advanced Optimization will do just that. If you suspect that your hosting infrastructure is also part of the problem, a Total Optimization is more tailored to that purpose – whether you’re looking to switch your hosting or just optimize the dedicated hosting setup you have now. With Advanced Optimizations, you will definitely notice an immediate improvement in load times and stability once one is complete. Since they are designed to squeeze every last ounce of speed out of your existing WordPress and hosting setup, they touch on every major part of the site that impacts its speed. And because of that, they’re ideal for every type of WordPress site – which is exactly why they are our most popular optimization package. Ultimately though, WordPress can only move as fast as the hosting infrastructure it is on. So whether your hosting setup is a 4 lane highway or an 8 lane highway, if only 2 lanes are open, your visitors will still be waiting in traffic for the site to load. If you suspect that your hosting infrastructure is also part of the problem or you have a dedicated hosting environment that you can control, our Total Optimization packages are designed to address that problem as well. How is this different from Basic and Total Optimizations? As a benchmark, we always aim to achieve a 3-4s minimum site load time even with our Basic Optimizations, but 3rd party factors like poor quality hosting can definitely impact that. Ultimately, our optimizations are designed to help your site tap into the resources that it has. So if the hosting offers it little in the way of resources, the impact of that poor hosting will be more noticeable. As an example, it is not out of the ordinary for a boosted site to take 4 seconds to load on a poor quality host and only 1 second to load on a higher quality host, while a non-boosted site might run equally slow on both hosts. That’s why ultimately if you’re looking to get the most speed out of your site, you will have to keep an open mind with your hosting and other 3rd party providers. And, of course, if you’re trying to max out your site’s speed and you have your own dedicated server or are willing to change your hosting infrastructure, then you may want to consider a Total Optimization which is more tailored for that purpose. That depends. Advanced Optimizations are designed to make your site as fast as it can be WITHOUT changing your hosting infrastructure or recoding parts of your site. So if you’re married to your current hosting infrastructure and it is not providing adequate horsepower to your WordPress site, then yes this package would offer the best you are going to get. But if you’re trying to squeeze every ounce of speed out of your site and you are open to changing whatever parts of your infrastructure may need to change, our Total Optimization package is better designed to do just that. Yes, all of the items that can be addressed on your website without breaking parts of it or changing your hosting infrastructure, will be addressed with an Advanced Optimization. So any issues that are reported that can not be fixed without breaking your site or that require a hosting infrastructure change would still be unaddressed in those reports, but all other types of issues would be addressed to the extent possible with your WordPress setup. Advanced Optimizations can usually be taken care of inside of a 2-3 business day window. Do your optimizations work with mobile devices?